In Part III, we explore the organizing effort of the Grand Rapids chapter of Women in Black and the local news media’s reaction to the Colin Powell presentation at the UN on WMDs, in early February of 2003. Women in Black was an international movement of women who non-violently opposed war, a movement which was begun by Israeli and Palestinian women. Grand Rapids formed a chapter in late 2002 and began to have a public presence at various demonstrations both before the US invasion of Iraq and afterwards. On February 4th, about 80 members of Women in Black attended the Grand Rapids City Commission meeting to demand that the city adopt a resolution against the war, just like many other cities had already done. Only a few members of Women in Black spoke, while most of the members stood in silence wearing all black. It was a powerful image that generated a great deal of discussion and media coverage, like the Grand Rapids Press article above. The City of Grand Rapids eventually adopted a resolution, but not until a year after the war had begun and the resolution was much weaker than the version that members of Women in Black and the People’s Alliance for Justice and Change had proposed. 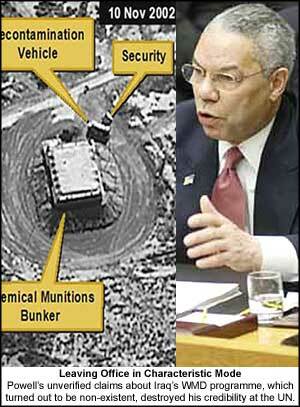 The day after the Women in Black demonstration, on February 5th, 2003, US Secretary of State Colin Powell had presented his findings that proved Iraq had Weapons of Mass Destruction (WMDs). This was the smoking gun that the US administration and the US media had been looking for, and while it was not cause enough to invade Iraq, the US government and the US media used it to win public support for the invasion. What was interesting about this news was that several Grand Rapids-based news agencies had contacted the People’s Alliance for Justice and Change to get their response to the Powell report. However, the local news agencies didn’t just ask for a response, they took the position that local anti-war organizers were wrong and needed to acknowledge their mistake. Members of the People’s Alliance for Justice and Change never accepted the Powell report as fact, but more importantly, they argued that even if Iraq had WMDs, this was not a valid reason for the US to invade Iraq. The US was in possession of more WMDs than any other country in the world and had used them more times than any other country. The local news media wasn’t interested in facts, they only wanted to make local anti-war groups look bad. Of course, we all know that years later it was proved that Iraq never had WMDs and that Colin Powell himself admitted that he lied during his February 5th, 2003 presentation to the United Nations. The local news media never apologized for their complicity in reporting Powell’s report as fact. This entry was posted in Anti-War/Anti-Imperialism and tagged effort to get GR City Commission to adopt anti-war resolution, Grand Rapids People's Alliance for Justice, Iraq war protest in Grand Rapids, WMD report by Colin Powell, Women in Black GR. Bookmark the permalink.